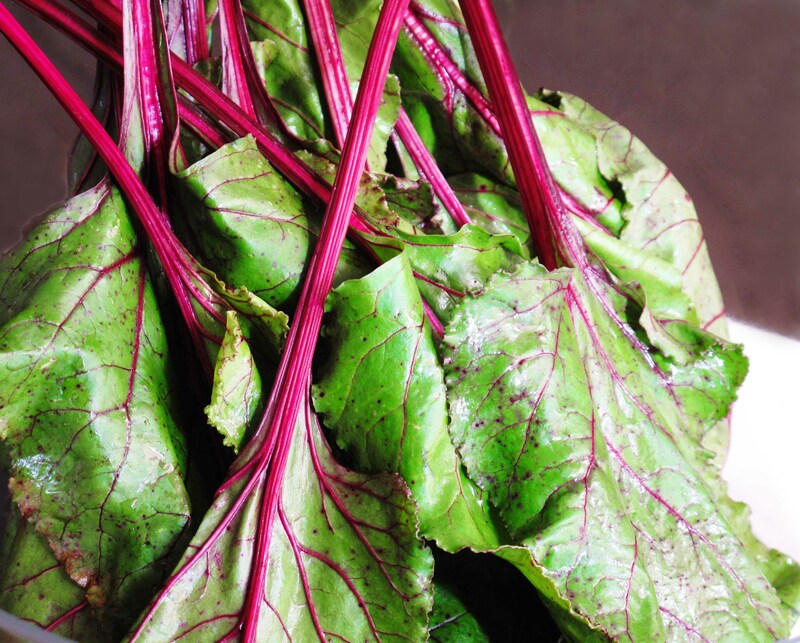 The last CSA farm share pick-up came with some delicious beets, which of course meant that I was left wondering what to do with the beet tops (greens) afterwards. Pretty much all of the recipes I’ve ever seen for beet greens involve sautéing them in some combination of olive oil, garlic, onion, white wine, and lemon juice. But I wanted something a little different. 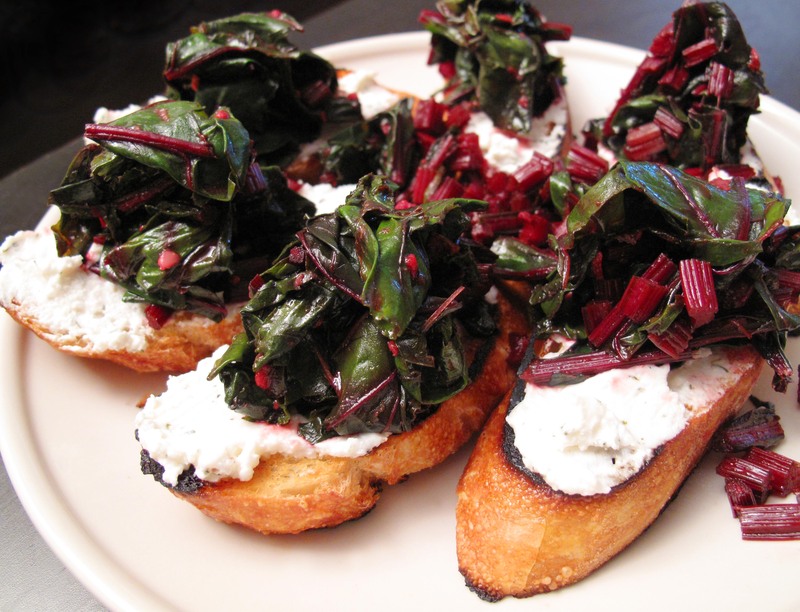 So luckily for me I discovered this recipe for crostini topped with beet greens and goat cheese – and I had leftover goat cheese! Not only did the recipe sound perfect and tasty, but the really awesome photography helped too. I picked up a long crusty french baguette at the store (and felt very French biking home with it sticking out about three feet off the back of my bike) and cut it on an angle to get longer slices. I toasted the slices in a pan with a little olive oil and set them aside. The beet greens needed a thorough washing (two actually) before I chopped the red stems into small pieces, and the leaves separately into strips. I sauteed two cloves of minced garlic (maybe a bit too much?) in extra virgin olive oil and then added the beet green stems and let them cook for about five or six minutes. Finally I added the leaves and let them cook for about two more minutes until they were nicely wilted, and tossed everything with balsamic vinegar and sea salt to taste. I mixed the herb-coated goat cheese together with fresh lemon juice and black pepper and spread it over each piece of toasted bread, topping them off with a heap of beet greens. The original recipe suggested putting a thin slice of lemon on each, which I didn’t do because I added quite a hefty squeeze of lemon to the cheese, but it would have added a nice color contrast. It was a (slightly messy but) great flavorful appetizer with grilled tilapia and heirloom tomato salad. This makes for happy taste buds – and lots of Vitamin A and K! This entry was posted in Cooking adventures and tagged sides, vegetarian, veggies. Bookmark the permalink. they’re really good braised with some sherry and butter. i have an approx recipe somewhere–also you can make a lithuanian cold cucumber/dill/beet top soup that’s amazing–i can send to you if you want to try. sounds kind of gross but is super yum.